Air fryers are quickly gaining popularity among fried food lovers, and I have a feeling you may want to join in and replace your deep fryer with this. The number of air fryer models in the markets today is going up as air frying becomes more popular. Every new model that comes out, claims to be better than the previous one. This makes deciding which air fryer to get quite a daunting task. In this post, I will discuss 5 air fryers that I consider the best in the market. 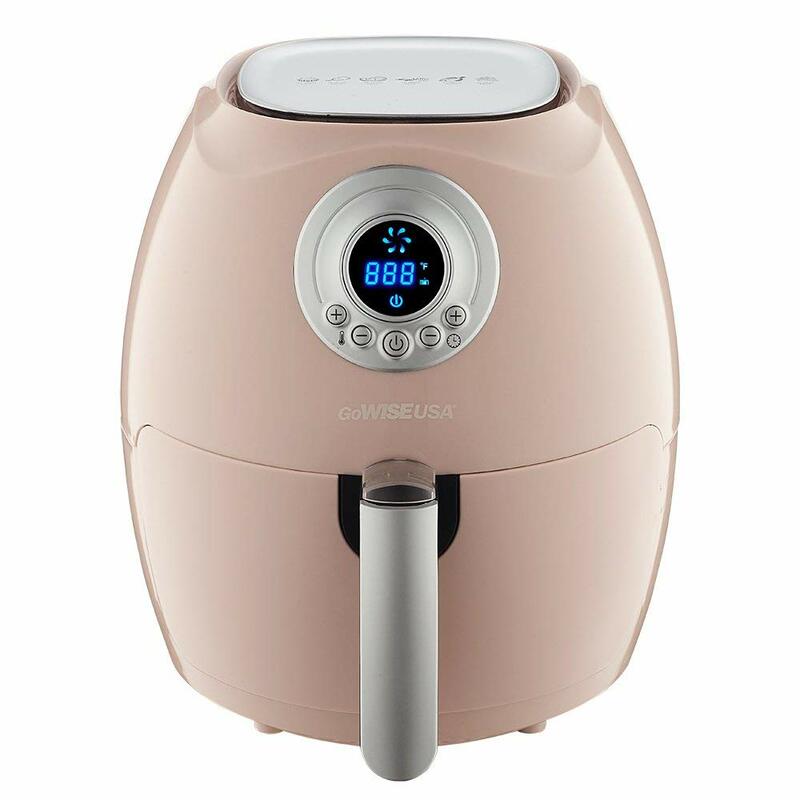 The GoWISE USA2.75-Quart Digital Air Fryer is a great kitchen appliance which enables you to cook your favorite fried foods with little or no oil at all. It uses Rapid Air Circulation (RAC) to cook food. RAC uses the hot air circulating inside the fryer to evenly cook the food from inside. It has a digital screen which allows you to set temperature from 170°F – 400°F and cook time from 1-30 minutes. This airfryer has an indicator which beeps 5 times to let you know when your food is ready. After the timer goes off, the air fryer fan will take about 20 seconds to stop. It has 8 presets including; warm, fries, chicken, steak, shrimp, fish, pork and cake. The GoWISE USA 2.75-Quart Digital Air Fryer is mini-sized and compact making it really great if you don’t have much space in your kitchen. This airfryer has a detachable, non-stick coated basket which is dishwasher safe, making cleaning and maintenance very easy. It also comes with a recipe book, making your cooking all the more easier. Has a sleek, modern design that looks great on any countertop. Do air-fried appetizers taste like oil-fried appetizers? Yes! I was shocked to find out just how much the fries I make taste like the regular fried ones. Does it smoke if you use oil? 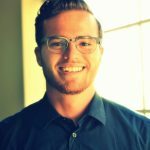 No, it doesn’t. But remember, the point of the air fryer is not to use oil. No, if wipe it out with paper towel after every use. Can it air fry a bag of frozen French fries? Yes, I do it all the time, they come out great. I usually do about 2 servings at 400 for 16-18 minutes. The GoWISE USA 2.75 QT air fryer is a great kitchen appliance which promises tasty healthy food in 30 minutes at the most. It is easy to use, and you can use it for cooking, frying, roasting and for making all sorts of yummy snacks. It is friendly priced and very easy to clean. This air fryer is perfect if you are cooking for one or for taking on road trips. It is also compact making it the best choice if you have limited counter space. The Philips Avance XL Digital Airfryer is one of the more popular models. It is a countertop appliance meant to replace your regular deep fryer. However, you will be glad to learn that it can bake, roast, and grill as well. This XL Airfryer from Philips uses Rapid Air technology to fry foods with little or no added oil. It has a starfish design which mixes superheated fast-circulating air to give you a healthier result, with fried foods coming out crunchy on the outside but remaining moist and soft on the inside. It is huge, with the ability to hold 2.65 pounds of food, enough to feed four people. Thanks to the Quick Air Technology you can cook a whole chicken in about 30 minutes and frozen fries in less than 20 minutes. It reduces eighty percent fats from the foods, making it a very healthy choice of fryer. The excess oil is collected at the bottom of the food drawer which is removable and you can dump it out after cooking. This fryer is easy to use, simply plug n play. You can actually use it without reading through the manual. It has a power on and off button as well as preset cooking function, temperature setting and time setting. The Philips Avance XL Air fryer has a digital touch screen allows you easily set temperature and time. This air fryer has adjustable temperature setting from 150 to 390 degrees Fahrenheit. You are able to reach your temperature of choice in just 3 minutes. It also has a digital display which allows you to keep an eye on what is going on inside the fryer. The maximum timer setting on this fryer is 60-minutes, after which the fryer will give a ready signal. It has smart presetting button to adjust temperature for cooking your favorite food quickly. The Philips XL Airfryer has auto shut-off as well as cool-to-the-touch exterior. These two extra features make it safe to have in a family setting. You get to choose between a black exterior and a white one to match the décor in your kitchen. The Philips XL Airfryer is fairly intuitive and easy to operate. simply open the drawer , place the food item you wish to cook in the food basket, close the drawer and use the digital touch screen to set the temperature and the time as you desire. You can pause cooking to check on your food. Cleaning is also a breeze as parts are dishwasher safe. If you don’t want to use the dishwasher, simply remove the drawer and basket immediately after cooking and soak gently in warm, soapy water. Rinse under running water. How much food can I cook in the Philips Airfryer? You can stuff it up to the MAX indication on the basket. Can I shake the food in my airfryer? If yes, why? Yes, you can. In fact, you should. This is to ensure the hot air reaches all the food surfaces. Does this airfryer use a regular 2 prong socket? No, you have to use a 3 prong one. 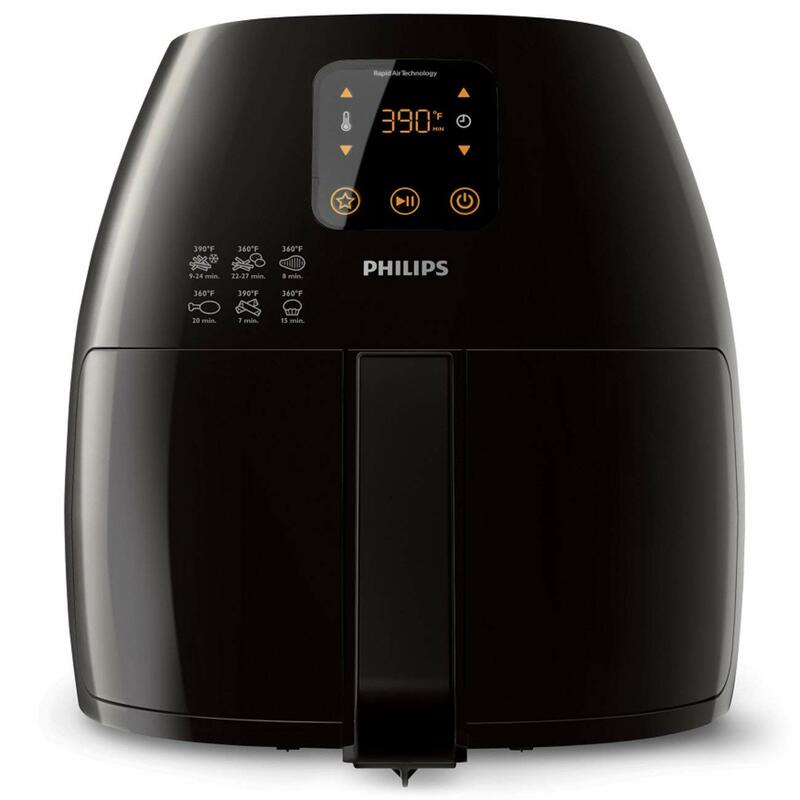 Do I need to pre-heat my Philips Airfryer? No, you don’t need to pre-heat it, although doing so for say 4 minutes could reduce your cooking time significantly. Can I use aluminum foil or baking paper in this Airfryer? Yes, you can. Ensure you leave enough spaces for air to flow through easily. The Philips Airfryer XL HD9240 is a great choice! It has a large capacity and comes with lots of really unique features. It is dishwasher safe hence, very easy to clean. Because it is XL, it is ideal for cooking for a lot of people. It may be pricey, but you will discover that it is worth every penny. If you love your greasy foods but feel the need to cook them in a low-fat way, then the T-FAL ActiFry is made for you. This small counter top appliance use hot air circulation system with pulsing action. It allows you to make low-fat French fries using only a tablespoon of oil. It also cooks fish, meat and desserts with ease. It has a sleek round design that is black in color. The T-fal ActiFry has a 2.2 pound capacity, enabling you to cook for four people at a go. It also has a window in the top for steam-free viewing of your food as it cooks. It comes with a stirring paddle in the cooking bowl to circulate the food gently to ensure it cooks evenly. The paddle and the cooking pan are ceramic-coated and removable, making it easy to clean, either by hand or in the dishwasher. 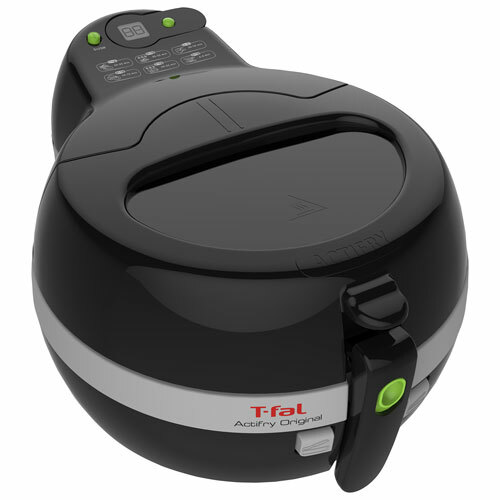 The T-fal ActiFry has easy to operate controls with an on/off button and a timer with a finish alarm. It has a cool to the touch exterior, making it safe to have around the home. It has only 1 temperature setting: 338 F. It’s either on or off. Smaller batches of food do not work well as they just get pushed around by the paddle instead of rotating to cook all sides. How many oil re-use cycles is recommended? Oil does go bad after some time of cooking, right? Can you leave the plastic oil container in while frying? Yes, you can. It even has a temp modulator in the drain just in case you hit the switch to drain oil it won’t drain. Does the oil filter itself, need to be replaced or cleaned? The filter is a built in wire mesh type and doesn’t need to be replaced as far as I can tell. The only part that may need to be replaced at some point is the rubber seal around it. The ActiFry is a great machine especially when it comes to those low-fat fries and stir-frys. It delivers although at a high price. The paddle takes away the need to flip the food, but you should still keep a close eye on the machine while it is running. One of the biggest drawbacks is the timer, which will not turn off the machine when it counts down. 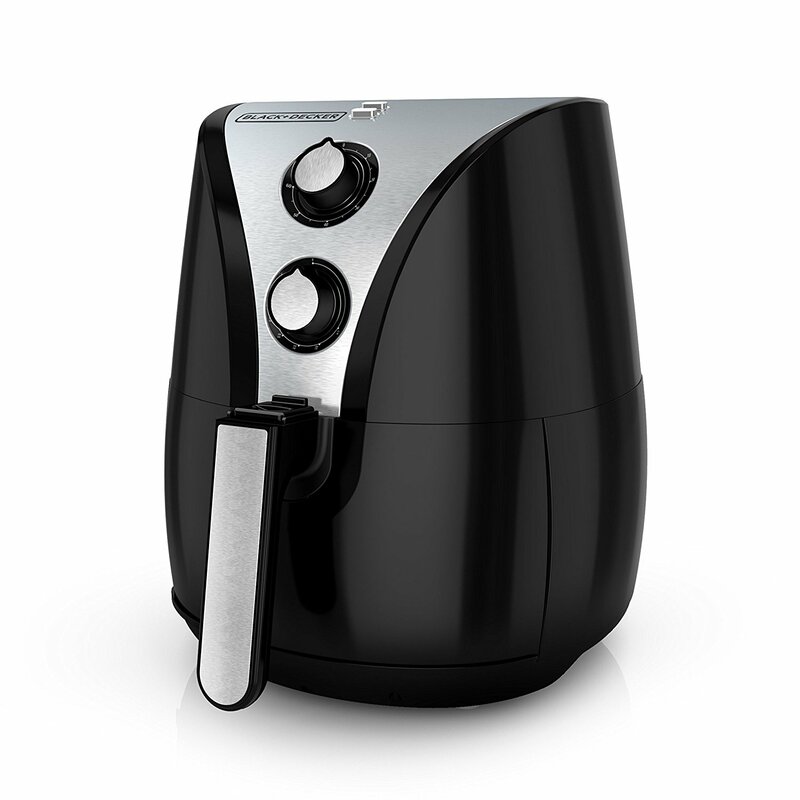 The BLACK+DECKER HF110SBD 2-Liter Oil Free Air Fryer is an amazing healthy substitute to the old-style deep fryer. 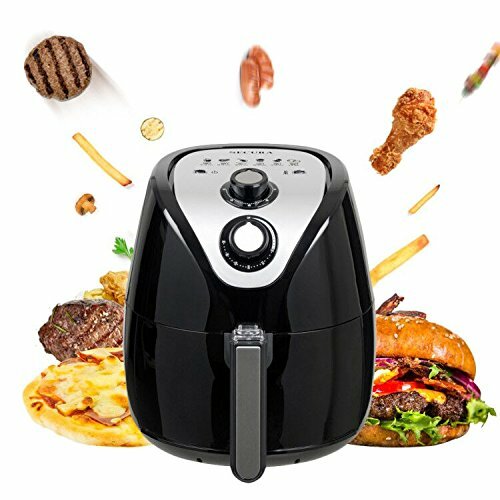 With this airfryer, you get to continue enjoying your favorite foods, in a healthy way. The airfryer is made from strong stainless steel material ensuring its durability. The basket is made from BPA-free plastic. It has a large capacity of 2 liters. This comes in handy when you are cooking for many people at once. The delicious fried food cooked in this appliance will still have the crispy texture without adding oil. It uses powerful convection fans around your food and heated air to ensure your food gets quickly and evenly cooked. It has an adjustable temperature control range of between 175 to 400 Degrees F to enable you to cook various categories of food from frozen root vegetable to pizza rolls. It has a 60-minute timer which allows you to completely cook various kinds of foods. The airfryer automatically switches off as soon as the food is done cooking. The basket of the airfryer is removable making it easy to clean or in the dishwasher. It has an indicator light for the power display to alert you when the fryer is on or off. The BLACK+DECKER HF110SBD also has an overheating protection shield which prevents it from getting too hot. This air fryer has a 2-liter capacity. It can hold about 6-8 wings or 4 drumsticks. Does it heat up your kitchen? It does, but not too much. This heat is much less than an oven or a deep fryer. Is there a preheat function on this fryer? There’s no pre-heat function. Try this, set the timer and then wait a few minutes before you add your food. It falls into the bottom of the chamber. Note that this air fryer comes with a food basket with holes. After usage, you can easily wipe off the dripping. Note also that both the basket and the separator can be thrown into the dishwasher. The BLACK+DECKER HF110SBD is a fantastic airfryer. It is well priced and has lots of great features. It is a choice you won’t regret. Go on and give it a try. You will love it. Do you have a big family and want to cook snacks and food all at once in an airfryer? The Secura 1500 may be your best option. This air fryer has a big capacity and large 3.2-liter basket. It has modifiable temperature control from 180 to 400 degrees Fahrenheit which gives you full and absolute control over what you are cooking. This airfryer uses very little oil and cooks the food using rapid hot air circulation. This technology reduces calories and Trans fats and gives you healthier and delicious snacks and meals for you and your loved ones. The Secura 1500 has a 0-minute timer which ensures that your food cooks properly. It also has overheating protection which though very important, isn’t found in all airfryers. Whenever an extreme overheating condition is detected, the unit’s inner temperature control system automatically triggers the overheating protection. Does this unit smoke up the kitchen/house? Since you’re using little or no oil this isn’t something you should worry about. How does it cook chicken wings? Are they crispy? This Secura 1500 is a great kitchen appliance. You can use for frying, for reheating food as well as for grilling. It is easy to use and clean and comes with a large sized basket which can fit some snacks or a meal for 3-4 people. The temperature ranges are 180-400F, which ensures all your foods are completely cooked. While it is a bit pricey, this airfryer delivers pretty well. It is ideal if you want to cook for your entire family at once. Size – some air fryers are huge, requiring more space than you may be able to spare on your counter top. Capacity – some air fryers are made to make food in small amounts, while others are suitable for huge meals. Make sure to get the right one depending on how much food you prepare on a regular. Fryer settings – look out for mode, temperature and any other settings you can. This is a key factor, because the performance of an air fryer heavily depends on its settings. Different foods require different temperature and mode settings. Versatility – some air fryers do more than just fry. Some bake, roast, grill and even steam. Consider this so that you get the most out of your air fryer. Wattage – the last thing you want to do is blow up a fuse on account of your new air fryer. Ensure your house is wired right to handle your air fryer of choice. Most air fryers require power of between 700-1500 watts. Price – in most cases, the more you spend on an air fryer, the more you get out of it. This isn’t always the case though. Ensure you get an air fryer that gives you the most value for your money. Safety settings – some air fryers have safety settings like non-slip feet, cool-to-touch handle and auto shut-off. You want to get one with the most safety features especially if you have children. Warranty – air fryers can be expensive and you want to be able to return yours incase it malfunctions. It is clear that all of these air fryers have a lot of great features. When all is said and done, the best air fryer is the one that suits your needs as a person. After testing and trying all of them out, I recommend the GoWISE USA 2.75 QT air fryer. It has a lot of desirable features all that combine to make your cooking easier and healthier. It is especially ideal for cooking for one and you can take it with you on a road trip, thanks to its compact size. Go for it, you will love it!